So glad to see you enjoyed this one as I did. I found the writing wonderful - it is a slow novel, but such a beautifully written one. wendy - It is beautifully written. And of those books that might be even better on a second reading. *nods* It's funny you mentioned that because right after I finished reading this I thought to myself that I needed to re-visit it again someday. I rarely re-read books...but when a book touches me in a certain way, I know I will want to read it again. This was one of those books. 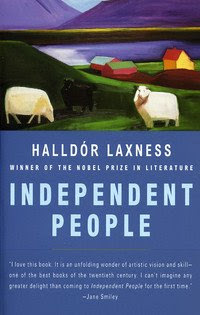 I thought Independent People was interesting, but getting through it was a long and painful experience for me. Ultimately, I came away feeling unchanged.